Waves cause cross-coupled surge, heave, and roll of the boom. If wave surge and current tension loads are taken through an independent bridle, they will have a minimum tendency to constrain the boom's heave response. Minimizing boom mass tends to increase the natural heave frequency and minimize the lag in heave response. Thus, ballasting for stability or even adding weight for flotation can be critical to heave. Flotation placement away from the faces of the boom yields stability and decreased lag in heave motion. If natural frequency exceeds wave frequency, the boom will follow the wave and minimize surge forces. If the boom does not readily heave or surge, the local force will be very high. Also, as the free water line meanders from the boom's still waterline, there are changes in roll movement. This is accentuated by current and wave surge. Thus, such a heavy-duty, slow sea response boom must be exceedingly strong, rugged and have a generous freeboard and draft. An example is the Merrit-Navy boom, consisting of 10-ft sections, each with 3-ft draft and 3-ft freeboard. It is constructed of 4-ft by 8-ft by 3/4-in marine plywood with a 100-lb ballasted fabric skirt. Four oil drums strapped on for flotation add to the section weight. All of this requires two 1/2-in wire ropes to be used for the tension bridle. An independent bridle takes the tension loads out of a number of independent boom segments. Each segment can be connected to the next by a slack skirt. Lines trailing from the bridle to the boom segment permit the best heave response but provide no roll resistance. Multiple lines from the bridle to the top and bottom of each segment can limit roll at the sacrifice of heave. Such a design was developed by Johns-Manville for the U.S. Coast Guard. This boom is compliant and responsive to sea action. It has survived 15-ft waves with swells breaking on the barrier. A number of booms have been employed on open ocean spills but there are no quantitative reports of their performance as a function of sea state and current. The U.S. Coast Guard boom is of minimum weight and is highly transportable (Hoult et al. 1970). Their 1972 tests in open seas of over State 32 were the first full-scale instrumented evaluations conducted. At up to 1-kt current, the oil leakage rate was very low. In these tests it held over 25,000 gal of oil in a thickness of 21/2 in. 2. From Sea State Table by Wilbur Marks, David Taylor Model Basin: small waves, becoming larger; fairly frequent white horses; moderate breeze (14 to 16 kts); 4-ft significant wave height (5-ft average of aQ;th highest); 65-ft average wave length; 28-naut. mi minimum fetch; 5.2 hr minimum duration of wind. A conventional weir with a smooth receding entrance, operating in a sufficiently deep contained oil pool, will perform in accordance with the governing rate depicted by equation 8.5(6) (Figure 8.5.3). The recovery rate/ft for one edge of a weir in a static pool of oil is plotted as a function of the weir immersion depth. The plot of the spreading rate/ft for typical oils shows how deep the oil must be to support a given removal rate. In this case the oil must be more than twice as deep as the weir immersion depth. If it is not, oil flow will be broken and the weir will flood with underlying water. This explains the importance of setting these devices to avoid water flooding. It also shows that thin layers of oil cannot be recovered without large amounts of excess water. The same principle applies to suction devices. In a current, weir flowrate over the lip increases in accordance with the rate equation 8.5(6). However, the flow-pipe below the weir lip can act as a barrier (Figure 8.5.4). FIG. 8.5.3 Weir flow and gravity inertial flow vs oil depth. 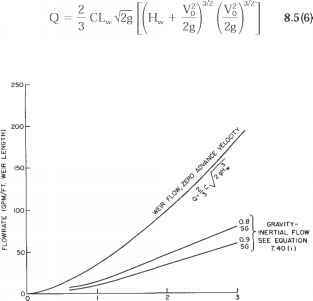 Key: Q = volume rate of flow over weir, in ft3/sec; Lw = length of weir, in ft; C = discharge coefficient « 0.6 (light oil with beveled, inward shaped weir); g = acceleration of gravity, in ft/sq sec; Hw = head, undisturbed level about weir, in ft; Vo = velocity of advance of weir, in ft/sec. FIG. 8.5.4 Weir drainage failure in current. If care is not taken, oil accumulates in front and drainage failure occurs. This becomes relevant when wave surge is present. Failure can be caused by a vortex at the weir ends through which the whole pool of oil drains. If current is not present and surge is reasonably low, small waves increase the average rate of flow due to 3/2 power dependence on head. However, care must be taken to avoid flooding. The usual practice is to provide a large flotation response area to match heave to wave motion and to provide for surge motion to avoid drainage conditions. To overcome weir difficulty of operating in thin slicks, various techniques of increasing oil depth may be used. The inverted weir, consisting of a shallow shaped barrier backed up by a second barrier, is one method used. In operation, thin slicks are diverted under the first barrier, and the current entraining the oil is recirculated to the surface as part of a vertical and countercurrent flow caused by the second barrier. In a more refined and improved design, secondary currents are avoided and oil resurfacing for concentration in the protected basin occurs due to the oil's buoyancy. This still requires a conventional weir or suction device to provide final oil removal from the thickened pool between the barriers. Many weirs are custom designed. The U.S. Coast Guard developed a prototype for open sea use consisting of a basin formed by two parallel booms joined by a flexible bottom. Oil and water flow over the first boom or through slots in it. The water gravity separates from the oil and escapes through slots in the flexible bottom. A sonic sensor detects the oil level in the basin, activating weir removal of the oil by the second boom. This class of recovery devices depends on moving an oleophilic, hydrophobic surface through the floating oil layer. The motion creates a viscous shear and attaches an oil boundary layer to the surface. The surface is then withdrawn above the waterline, where the oil is extracted and pumped to storage. The advantage of this device over the weir is that it will not flood with water when the oil is thin or the immersion depth varies. One lifting surface device, the vertical disc, can be efficiently packaged into a small volume with disc spacing of 2 in or less. The device was originally available from Centri-Spray Corp. for calm water applications. An improved version called "Clean Sweep" using discs and vanes was commercially introduced by Lockheed (Bruch and Maxwell 1971). Model test data indicated that the mod ification will function at over 2 kts current or forward way in as high as Sea State 43 and will recover all oil encountered to a thickness of at least 0.1 in. These tests were conducted with disc diameters from 10 in to 8 ft. In a 4-ft diameter it will recover 100 GPM of 1000 cst oil per ft of device in a 1-kt current. It can recover oils with over 10,000 cst viscosity. The U.S. Coast Guard awarded Lockheed a contract to develop a prototype air-transportable system for oil recovery use in up to Sea State 4. Moving belt units were successfully used to clean up weed and peat moss contaminated residual oil from a spill in cold Canadian waters. A small pond type unit is also available. Similar to the moving belt is the rotating drum. The drum is usually employed only in calm water applications. One type, developed by Amoco and the subject of several improvement versions, uses an absorbent polyurethane foam-covered drum. Different density foam covers are used for various viscosity oils to the maximum recommended 2500 cst. Many agents will disperse oil in water; generally, their use is prohibited by the EPA unless they protect human life, property from fire, or an endangered species from more direct damage. 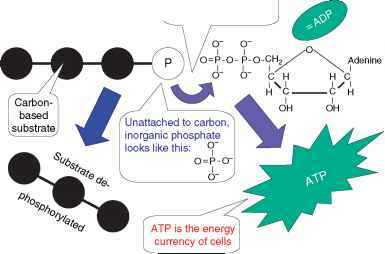 Both biological toxicity information and oxygen requirements for biodegradation are necessary to obtain an intelligent appraisal of their safety. Sinking agents are used only with approval in waters more than 100 meters deep, where there are no fisheries or onshore currents. Approval is only given when no other feasible means of control is available. They present a significant logistical problem, since a pound of agent will only sink ]/-5 pounds of oil. An efficient agent should be permanently hydrophobic, permanently oleophilic; high in density; inexpensive; readily available; and easy to spread. Table 8.5.2 compares the characteristics of a number of commercially available materials, of which only stearic acid-treated chalk has been used in quantity. 3. Moderate waves that take a pronounced long form, many white horses; Fresh Breeze (18 to 19 kts); 6.5 ft. significant wave height (8.3 ft. average of 1/10th highest); 95 ft. average wave length; 55 nautical mile minimum fetch and an 8.3 hour minimum duration of wind.